GOG is trading donations for games in a fundraiser lasting until November 12th. GOG, the digital retailer of classic, DRM-free games, has announced that, starting today, it will be launching a new event aimed at raising funds for charity. 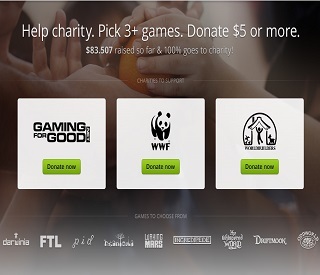 The "Pick 3+, Donate $5 or More" funding drive will see the online store team up with organizations including the World Wildlife Fund, Worldbuilders and Gaming for Good to help further their efforts to make the world a better place. GOG is asking gamers to contribute at least $5 to one of the three aforementioned charities. In return, it will give donors three (or more) free games from its library. The games being offered as rewards will include the likes of FTL, Waking Mars, The Whispered World and Darwinia among several others. The digital retailer will be receiving no profits from the proceeds of the fundraiser. In fact, it will actually be spending its own money to make sure the three organizations receive the full benefit of the money contributed by the company's customers. "In order to make sure that a $5 donation doesn't end up becoming a $5 donation minus credit card fees, VAT, and other expenses, [GOG] will be spending nearly $0.25 on every dollar raised to make sure that every $5 donation equals $5.00 given to charity," said the retailer in an announcement. The developer's whose games are involved in the fundraiser will apparently also be suspending their usual royalties to help strengthen the donations. What all of this amounts to, of course, is a great deal for gamers. In addition to getting your hands on some cool games, you 'll also get to enjoy some of those warm-and-fuzzy feeling that come from doing something nice for someone else. The "Pick 3+, Donate 4 or More" event will run until November 12th.